Florida is a visual treat. If I lived there, I would have something fun and interesting to comment on every day. As it is, I am back home in San Francisco and left with only fun and interesting remnants. Speaking of fun and interesting...let's talk gas stations. 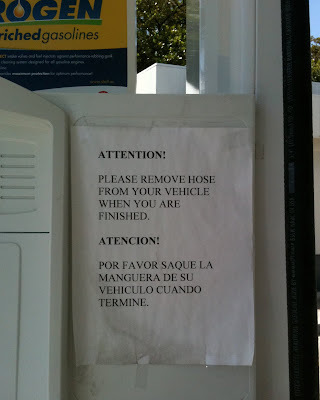 Residents of Key Biscayne are evidently so forgetful that local gas station owners have been forced to remind customers that one must REMOVE THE GAS HOSE FROM THE CAR after one is done pumping gas. But this is obviously a problem in Key Biscayne, and it's enough of a problem that it requires a sign. Many gas stations have signs warning of a horrible death if you use your cell phone while pumping gas. Not here. That's too complex. Maybe the Key Biscayne Jaguar/golf cart drivers forget that they are at a gas station...or alive for that matter. Maybe they just doze off while gas is pumping. The ever-popular gas station/orthodontist/sleep apnea specialist. If they have drive-thru service, it might be the coolest idea EVER! Nothing says Drive Through like Nitrous oxide! When I was small, I was with my best friend and her mom. Her mom pulled over to get gas. Then the next thing we know is a gas attendant flagging us down as we leave the gas station. Apparently, my best friend's mom pulled away and took the hose with her! Wow, that's a lot bizarre! Christine - I forgot to check and see if they still had the air/water station thingy outside. 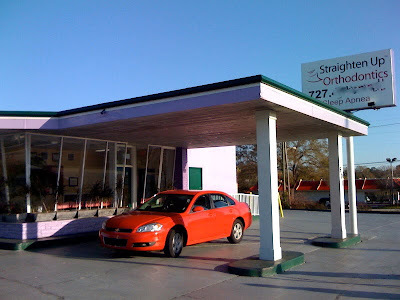 You could just pull up, take a hit of nitrous, and then proceed to the drive thru for your new fluorescent fake grill. Mrs. Newlywed - did you grow up in Florida? That might explain it.